Our fans’ panel have their say on Leeds United’s 1-1 draw with Brentford. Players suround referee Jeremy Simpson. We all knew it was going to be tough against Brentford, a side renowned for playing a similar high press passing game to ourselves, and so it proved to be. What we didn’t know was that we’d be playing the referee as well! I’m not saying Jeremy Simpson was biased at all, but the majority of his poor and inconsistent decisions adversely affected Leeds far more than they did the Bees, including a penalty decision that, the more you see it, the more it is clear that Watkins conned Mr Simpson big time. The positive to come from this game though is that we also know that in days gone by we would not have found the backbone and resources to recover from a setback like that; this Leeds side is a different proposition and to get the point we deserved will be a huge encouragement going forward. Lady Luck didn’t smile upon us this time, but she will in the weeks and months ahead and the international break has come at a good time as we wait to get our injured troops back into the front line. Oliver Watkins wins Brentford's penalty. Man of the match: Pontus Jansson. In three of our home games this season, against Middlesbrough, Birmingham and now Brentford, we have been denied all three points because the referee created the circumstances for the game to descend into farce. Saturday’s performance by the man in the middle was an all time low, Jeremy Simpson was incompetent, inconsistent and incendiary. Leeds Unietd fans react during Saturday's 1-1 draw with Brentford. The game was set up to be a great one, two teams playing with style and purpose with passing, attacking and shots on goal aplenty. Unfortunately Mr Simpson decided that the game should be all about him. He gave a penalty that wasn’t a penalty, missed a headbutt in the dugout, awarded a free-kick to Gianni Alioski for falling over and, when both team’s number 2 committed a second yellow card offence, he decided only to send off the one wearing white. These were just the highlights of an all-round woeful performance. A draw, fortunately a fair result, was only confirmed thanks to the late equaliser from Pontus Jansson who was absolutely dominant from start to finish. Leeds salvaged a draw ‘at the death’ of a interesting game between two teams who of late are not firing on all cylinders. The 1-1 draw may not have been a classic but there was enough incident in the game to keep 32,000 fans interested. Sheffield United and West Bromwich Albion won so moved above Leeds in the Championship. This was another of ‘those’ games when Leeds did enough to claim the three points. Chances again went begging and Luke Daniels in the Brentford goal also denied the home side. Brentford may think that they should have been in front by the break, Ollie Watkins’ deflected shot came back to leading scorer Neal Maupay but he jumped too early and Bailey Peacock-Farrell saved the rebound. Whatever was said to the players during the break had a definite impact, Kalvin Phillips must still be wondering how Daniels kept out his goal-bound effort and the referee who was having a poor game gifted the away team the lead just after the hour mark. Watkins did a ‘Tom Daley’ in the area as he went for a ball in the penalty area and clashed with Peacock-Farrell, the referee took a minute or so before awarding the penalty, much to the disgust of Leeds players, coaches and supporters. Maupay didn’t pass up a second opportunity to score. Leeds made three substitutions to try and force a equaliser, Jack Clarke getting his first outing in the Championship and with time running out Gjanni Alioski put in a beautiful free-kick that was met by Pontus Jansson who directed the ball past Daniels, Leeds so nearly won it in injury time when another cross from Alioski was met by Lewis Baker but his header just went narrowly past a post. Luke Ayling was sent off after picking up his second yellow card for a foul on Alan Judge in injury time. A draw was a fair result, but the officiating left a lot to be desired. There’s a song that Leeds fans sing about referees of, shall we say, poor quality, but with the tension of the game it wasn’t heard as much as it should have been. It would’ve been well deserved on the basis of Jeremy Simpson’s performance, but Marcelo Bielsa isn’t one to use the officials as an excuse. Many, including Bielsa, will feel that a draw was the correct result on the basis of this being two well-match teams who play attractive football. Leeds weren’t as fluid as they have been this season but they always know how to cause havoc. But others will be left wondering what might have been had Ollie Watkins been deservedly booked for diving. Despite the back four sometimes causing their own problems, it was another defensive masterclass from Pontus Jansson who looks like the leader Leeds missed last season. He bailed out his team-mates on multiple occasions, and in a high-stakes game like this it was essential that Leeds didn’t go two goals behind. I must remember to search out Brentford manager’s compilation video: Talking Nonsense with Dean Smith, featuring such hits as ‘The Grass is Too Long’ and ‘That was a penalty’. Good coach, top banter. Strange day. For those of us sober enough to monitor reality, ref’ Jeremy Simpson began by moving in mysterious ways and then upped tempo into to full-on body-popping mind-blowing muppetry. You might pick up you’re doing a tad poorly when Leeds fans round on you for awarding a free-kick to Leeds. Gjanni Alioski fell over. Foul. Generously Elland Road suggested it wasn’t. But no, failing to take the hint, Jeremy’s Sky spectacular continued with the awarding of a penalty, the first ever given in a professional match where the two players involved were not in the same hemisphere. All three of Bailey, Peacock and Farrell were rendered incredulous. Debutant Jack Clarke suffered a serious assault in front of 30,000 witnesses but Simpson deemed it mere chaff and banter. With seconds to go, a foul by Luke Ayling, a friendly tap by comparison, saw him dismissed from the field. But let us be fair. Brentford are a good side, worthy of a point and this might well have been a cracking match had it not been for Simpson’s showy attempts to prove he can handle a big match. He obviously can not. Perhaps he reflected on that in the referee’s room for so long after the game had finished. Man of the match: Gjanni Alioski. Another frustrating afternoon at Elland Road saw Leeds draw with Brentford and slip to third place. The unrelenting nature of the Championship ensured that Sheffield United and West Brom nudged past the Whites as yet another international break gives everybody time for a breather. Let’s hope that it gives the referee, Mr Simpson an opportunity to reflect on the consequences of his decision making. He penalised Bailey Peacock-Farrell after he had made a fine reaction save with his feet. Ollie Watkins was already falling as he flung himself over the goalkeeper’s outstretched arms. Now Bailey is a big lad and this means that Watkins was about eight feet away from the ball when the incident occurred. Simple logic would suggest that there was no need for Bailey to do anything illegal. Nevertheless Maupay dispatched the resultant spot kick. 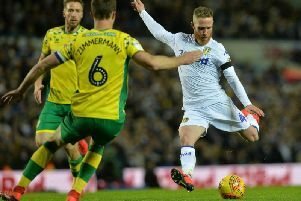 Simpson further angered the Elland Road faithful by sending Luke Ayling off near the end of the game. Pontus Jansson capped a fine display with the equaliser, giving Leeds no more than they deserved.